When my truck needs an oil change, it reminds me with a message on my dash. I appreciate the reminder, because I'm sometimes terrible about remembering the schedule for oil changes! My truck is reminding me right now that I'm getting close to needing an oil change. 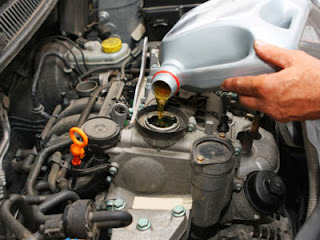 So, I found it interesting that I received some information from the site -- MotorOilMatters.org -- that provides excellent information about what you should look for in an oil change! At the site, you can even find a downloadable PDF checklist that gives you tips about what you should look for when getting your oil changed. I know that I often blindly trust the mechanics that change my oil. I have no idea what viscosity oil my truck needs -- but after reading through the materials, I am going to look in my owners manual to find out! I really shouldn't leave it up to them and/or Bo to make sure my truck is well taken care of. When's the last time you had your oil changed? The folks from MotorOilMatters.org have generously offered to provide one of my readers with a $50 gift card so they can get an oil change! Check out their site and leave a comment below with one fact that you learned to be entered into the giveaway. You can earn a second entry by liking my blog's Facebook page or the MotorOilMatters Facebook page. (www.facebook.com/mylittlepatchofsunshine or www.facebook.com/motoroilmatters) Just leave a second comment letting me know that you "liked" the page and which page you "liked." I'll let random.org choose a winner on July 31, 2013! Be sure to leave an email address so I can contact you. I learned that an oil level that is too high or too low can increase oil consumption. Oil keeps your engine clean. And you need to look for the MOM insignia when you get an oil hange.